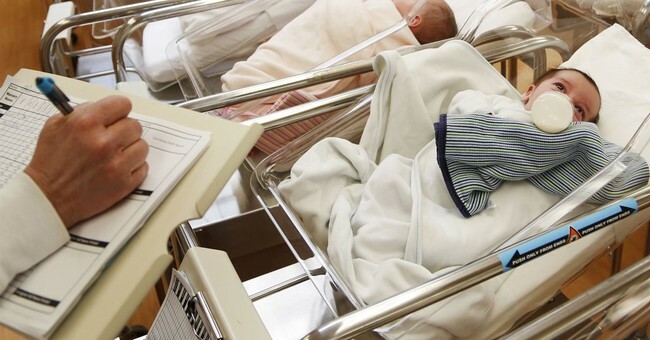 Will the Trend Of Low Birth Rates Be Reversed? Sometimes a society's values change sharply with almost no one noticing, much less anticipating the consequences. In 1968, according to a Gallup survey, 70 percent of American adults said that a family of three or more children was "ideal" -- about the same number as Gallup surveys starting in 1938. That number helps explain the explosive baby boom after Americans were no longer constrained by depression and world war. Those values and numbers didn't last. By 1978, Gallup reported that only 39 percent considered three or more children "ideal." The numbers have hovered around there ever since, spiking to just 41 percent in the late-1990s tech boom. Similarly, the 1970s showed sharp increases in female workforce participation, divorce and singe-parent households, as well as decreased participation in voluntary organizations -- all unanticipated. Is a similar values shift happening now? Maybe so, suggest George Mason University associate professor Philip Auerswald and Palo Alto hedge fund manager Joon Yun in an article in The New York Times. They point out that the American fertility rate -- the number of children per woman age 15 to 44 -- has hit a post-1970s low. Birth rates typically drop during recessions and rise a bit during booms. They did drop notably from 2007 to 2009. But the latest data don't show a rebound, despite significant growth and record-low unemployment. The trend varies among demographic groups. Native-born Hispanics and blacks used to have birth rates above the replacement rate (2.1 births per woman). Now they're below replacement, almost as low that of as native-born whites and Asians, which are down only a bit. The immigrant birth rate remains above replacement level among blacks, but only barely above among Hispanics, and below among whites and Asians. One possible consequence: Those often-gleeful predictions that whites will soon be a minority will not be realized so soon, or maybe ever. Nor is it clear, as sociologist Richard Alba has suggested, whether often-intermarrying Hispanics and Asians will see themselves as aggrieved minorities. They might just blend in, like Italians and Poles. Also, the sharp drop in the Hispanic birth rate combined with the sharp drop of Hispanic (especially Mexican) immigration post-2007 means a lower proportion of low-skill immigrants competing for jobs with low-skill Americans. Asian immigrants may outnumber Hispanics and arrive with significantly higher skill levels. So may immigrants from African countries like Nigeria and Ghana. Their capacity for expanding the economy rather than competing for low-skill jobs may point to unexpected growth. And neither group arrives with grievances rooted in slavery and American racial segregation. Other familiar trends may be reversed. Demographer and Institute for Family Studies research fellow Lyman Stone, citing various data, argues, "The decline in fertility is mostly due to declining marriage," as downscale women have had difficulty finding suitable spouses. They might have more success if the recent increase in downscale wages continues. Similarly, fewer young people would get caught in the trap of incurring huge college debt for worthless degrees or none at all if, as the Manhattan Institute's Aaron Renn suggests, enrollment in higher education, already declining, starts plunging precipitously around 2025. Might young people bypass college and find constructive jobs and marry and raise families as their counterparts did in the postwar years? That's suggested by a recent trend reversal. During the sluggish 2008-2013 economy, young Americans stayed put in tiny child-unfriendly apartments in hip central-coastal cities like New York and San Francisco, and paid high rents resulting from stringent environmental restrictions. This was hailed as a move toward progressive attitudes. But evidently not. As Newgeography proprietor Joel Kotkin has noted, since growth returned, young people have been heading to child-friendly suburbs and exurbs, ditching subway cards for SUV fobs. All of which raises the possibility of current stubbornly low birth rates being on the verge of a rise, away from the economically and culturally divided low-birth-rate society described in Charles Murray's "Coming Apart," and toward something suggested by Donald Trump's "Make America Great Again." For the moment, these countertrends are just possibilities. But since persistently low birth rates lead to population loss, economic stagnation and low creativity, let's hope some of them come true.